Why Natural Stone Is Best for Your Patio – Mees Distributors, Inc.
Travertine is a great material for your patio because it stays cool even in direct sunlight so that you and your family can comfortably walk barefoot. Travertine is also very durable and can withstand rain and snow without deteriorating. Granite has long been popular for home interiors, and it is growing in popularity for outdoor use as well. The natural look of granite blends seamlessly with plants and other outdoor elements for a classic, elegant look. Granite is one of the toughest natural stones, so it works great in high-traffic areas. Limestone is a quarried stone, meaning that it is mined in large chunks. The key benefit of this for you is that it can be cut down into virtually any shape or size you like. Choose a square cut to create a traditional tiled look, or create a mosaic look with smaller pieces. You can also use large, roughly cut pieces to create winding pathways throughout your yard. Limestone comes in a variety of shades, so feel free to mix and match to create a unique look. The shades are similar enough that they will complement each other perfectly. Slate is a great natural stone paver option for your patio. As with limestone, you can opt for smooth- or natural cleft pieces to create visual interest. Let grass grow in between the stones for a stunning, all-natural look that perfectly complements the dark hue of the stone. Slate is great around pools, thanks to its naturally slip-resistant surface. At Mees Distributors, we have all of these natural stone types available for purchase in a range of styles and colors. 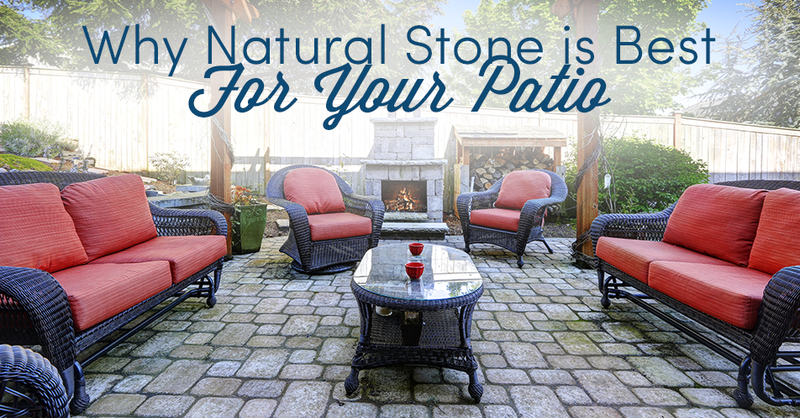 We’ll be happy to help you settle on the perfect option for your patio remodel. Stop by our expansive showroom today to see what natural stone we have in stock for your remodel or new build!